The US Army and Marine Corps experimented with a wide range of flame-thrower tanks through World War II in both the European and Pacific theaters. Although the US Army deployment of flame-thrower tanks in the ETO was problematic at best, flamethrowers were much more widely used in the Pacific theater and became ubiquitous by 1945, including an entire Army flamethrower tank battalion on Okinawa in 1945, the largest single use of flamethrower tanks in World War II. 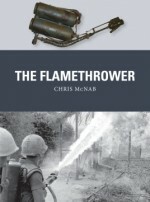 This will cover the initial attempts at the use of auxiliary flamethrowers by both the US Army and Marine Corps in 1943, the standardized adoption of the Satan flamethrower tank by the Marines in 1944, the development of main gun flamethrowers by the Marines and US Army based on the POA-CWS designs, and the myriad other types tested in combat including the powerful LVT-4 design using Navy flamethrowers at Peleliu in 1944. Due to the extensive Japanese use of fortifications in the final year of the Pacific war, Flamethrower tanks became one of the most important solutions in American tactics.